At the weekend (sounds like a year 3 recount, I know) I went to my first researchED event - the national conference, which was held at Chobham Academy in some part of London or other where you can almost see the money pouring into it (but as a Northerner, that's a rant I'll avoid now). With a whole host of speakers it wasn't easy to pick which sessions to attend - a good proportion of the train journey down was spent poring over the workshop descriptions and in some slots I had up to 5 possible choices. There was a definite air of excitement as teachers and other professionals poured into the school's largest hall; it felt good to be part of something which, compared to other conferences I've attended, seemed so big. Almost immediately I spotted the familiar face of Mark Enser, a wonderful teacher (I'm sure) and writer whose articles I always find myself nodding along to vehemently (in truth, he writes the stuff I most wish I'd written). It was great to meet him in person albeit briefly and I had the pleasure of meeting for the first time some other people who I had previously 'known' online: Dr Emma Kell (who may live to regret a subsequent proposal to co-present something one day), Justin Gray, Karen Wespieser and Kieran Dhunna Halliwell as well as a second time meeting with Martin Galway. Making those face-to-face connections was a real highlight although in each case I wish I'd had longer to chat, but it was always onto the next workshop. Allow me to give you some of the context behind why I was so keen to attend researchED. My MAT recently won the bid to be one of the EEF's research schools as we are situated in one of the 'opportunity areas'. I will be working on the team to develop the research school's role in our area and, although I have recently attempted to be more evidence-informed in my approach, I felt this a good opportunity to sharpen my understanding and skills with regards to educational research. they understand that when they are asked to do something it's because there's a good chance it'll work. Because of all this I chose some sessions to help me begin to think about how to help teachers who have no knowledge of or interest in educational research to begin to take notice of its possible benefits. Dr Gary Jones led a session on being efficient when it comes to evidence-based practice and Nick Rose spoke on helping new teachers to use research in their teaching. Both speakers were incredibly knowledgeable and I found much of what they had to say to be very interesting but I struggled to come away with much down-to-earth, practical advice for how to help teachers to make their practice more evidence-based. And that would be my overall observation of the day. Speakers presented knowledgeably but left me with very few concrete ideas as to what to do with the information. Now, I don't claim to be at all academically-minded in the way that many of the presenters are, but then, neither are many teachers - the ones who we'd like to use evidence or research to inform their teaching. Upon reflection, it is very clear that there is much work to be done to bridge the gap between research and classroom practice. For example, Nick Rose discussed in great detail that which hinders new teachers (and other teachers) from reading research and using it to inform their teaching but in amongst that he mentioned that the best way is to use case studies. If that's the case, I'd have liked the session to focus on how to access case studies, how to write case studies, how to help teachers see the potential and limitations of being inspired by case studies. Dr Gary Jones provided a wide range of ideas but I would have benefited more from spending more time on just one or two of them. Dr Gary Jones helpfully pointed out that research is only one of the strands which informs evidence-based practice and that data is one of the other pieces of evidence we have to help us make decisions about teaching. Mike Treadaway shared some fascinating national data on pupil premium children but again, there was very little suggestion as to how teachers might use this information to inform their teaching, only a suggestion that the funding formula needs changing - something none of us have a say in. When blogging and writing articles I often get to the part where I've made my point, discussed the theory or presented the research (or finished my rant) and there I want to stop. But increasingly I've forced myself to go further to do the hard bit: provide some practical advice relating to the subject of the blog post or article. It's not easy and I suspect the ability to do it it relies on teacher expertise and experience, not just research. Much of the advice I've ever been given has not been borne out of research, but out of teachers' own experience. One point discussed in Rachel Lawrence's session on 'What should a research leader in education do?' was whether or not someone leading in research needs to be a teacher: the discussion seemed to conclude that they would be listened to better if they were a respected teacher who colleagues knew could walk the walk. 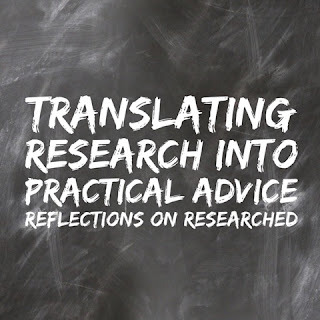 Perhaps the divide between research and practical advice arises because those involved in research aren't always teachers, and vice versa? I can't be sure. Having said that, I am aware that there are many resources out there which marry research with good practical advice. The EEF reports for example, and Dominic Salles' book 'The Slightly Awesome Teacher'. I also noticed that Robin Macpherson (whose session I didn't manage to get to) has a book in the pipeline called 'What Does This Look Like In The Classroom? Bridging The Gap Between Research And Practice' which does sound very promising. There are clearly also many books written on many subjects which seek to translate research into practical advice and it's this approach that more teachers would benefit from. Martin Galway gave me food for thought when it comes to disseminating research by pointing out that often we don't read the original source of the research but instead read blog posts, news articles and meta-studies of the published research. 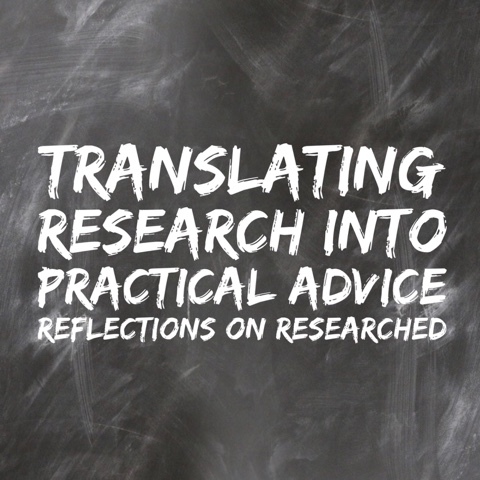 Often we read secondary or tertiary accounts of the research and much can be lost in translation resulting in practice which doesn't do what it is supposed to do. This will be a real challenge for the research school and something that needs navigating carefully. Again, some practical information on how to do this would be really helpful - this may have happened in some of the other seminars. I managed to take in a wide variety of seminars, including a panel discussion, and whilst the short sessions meant that interest never dipped, it did mean that some presenters were pushed for time. It's totally out of the organisers' hands but it may have been more beneficial to narrow the focus of some sessions in order to get one point across well and include some time for questions and discussion. Again, this reflection is important for how the research school carries out any CPD - a honed down, precise objective needs to be stuck to when presenting crucial information about research and how it might impact on practice. Now obviously I only attended a very small percentage of the available workshops and so my reflections may not be an accurate overall picture - I'm very aware of this. In fact, this blog post from Jessica Fear just goes to show that some will have left the researchED brimming with practical advice to follow. Hopefully it's clear that I've framed my thoughts by thinking not about how researchED might change (I'm under no illusions - I don't have that influence) but by thinking about how my limited experiences at the conference will form how I think about how to engage teachers in the use of research over the coming year. To finish, I would reiterate that the conference gave me much to think through and made me aware of research that has already taken place, research techniques that I knew nothing of before and gave me a better overall idea about the world of educational research. There are things that I will go on to explore further and there are other seemingly small titbits of information that will actually hugely influence my own practice once I've spent more time thinking through how to apply them practically. Would I recommend a researchED event? Yes, to anyone. I'd say go with an open mind, even if you think research isn't the be all and end all. After all, Tom Bennett himself in his opening speech reminded us all that "the craft of teaching is enormously important" and Nick Rose made it clear that "evidence-based practice is not a recipe to dictate what a teacher does, nor is it to undermine professional judgement, rather it is to inform and refine it". I think there needs to be some way for teachers to access research publications more readily - I believe membership of the Chartered College allows access to journals, perhaps that's one way. Dr Gary Jones mentioned that if you come up against a paywall a kindly worded email to the author 4/5 times results in them sending you their paper! Worth a try! Thanks for taking the time to share your reflections - I think this issue of 'how can we actually make it practical and manageable to use research in schools on a regular basis?' is one that a lot of people are now trying to grapple with. A group of us (admittedly based in London, but very welcoming of those outside) have set up a group called the Research in Schools Learning Community which also has a Google+ group as an attempt to create a space for people to discuss practical ideas and share experiences. It has been a little quiet over the summer, but we are hoping to get the conversation up and running again this month. Welcome!